BY DAN BUSKIRK FILM CRITIC My whimsy alert was on hair trigger at the start of this indie rock flick about the adventures of a band led by the paper-mâché-head-wearing title character. Was this story of a rising and falling band really going to try to sell me on the child-like wonders of painted smiles and singing a simple tune? The opening of this music-driven little film hits exactly that mindlessly carefree note but it is a great pleasure when Frank dares to takes its oddball situation seriously and heads for darker comic ground. Domhnall Gleeson (Brendon Gleeson’s son and Bill Weasley from the Harry Potter films) is the narrator Jon, presented as a keyboardist and uninspired songwriter in the film’s opening. When the band with the unpronounceable name “Soronprfbs” swings into his small U.K. town needing a keyboardist, Jon gets sucked into their orbit. Without hesitation Jon ditches his life to join the band on a promised musical odyssey, one that takes them across borders and seas and ultimately to a stage at Austin’s South By Southwest festival, where surely stardom awaits. Things grow progressively weirder as the band’s journey goes on, and not just because Frank is never — EVER — seen without his giant fake head. Decorated like a cartoon from the 1930s, the head has a giant painted grin so happy you just know it’s masking a terrible sadness beneath. The script is co-written by Jon Ronson (The Men Who Stare at Goats) who actually spent time in the band of Chris Sievey, a British comic performance artist who performed in a fake head under the name Frank Sidebottom. The film’s story is only loosely connected to this real performer but Ronson definitely catches the egos and interpersonal dynamics that surface in rock bands. The music by Stephen Rennicks is spot-on too, giving a bit of Flaming Lips-style madness to their sound (real drummer Carla Azar of Jack Black’s band lends some authenticity as well). Maggie Gyllenhaal is a tornado of attitude as the sullen theremin player Clara, who foments suspicion that Jon is responsible for a negative influence building in the band. An empathetic reading of her character is that she is protective of the fragile Frank, whose personal state is obviously hard-to-read but then again maybe she is just up to her own selfish manipulation. Clara may not be hiding behind a giant paper-mâché head but her feelings and motivations are nearly as unreadable as Frank’s. The character of the dopey Irishman Jon sits at the middle of this story and most the time he is a little baffled about what is going on in the band’s cloistered, claustrophobic world. Working in rural isolation on their long-gestating masterpiece debut recording, Jon’s character makes for a frustrating ambassador. Self-conscious and kind of square, Jon’s role in the band seems fairly unimportant but there is more here than first meets the eye. Jon’s square ambitions for the band rankle Clara and as the story saunters forward and Jon’s goals begin to seem more naively benevolent than first apparent. It can be artistically thrilling to work with the off-kilter Frank but their frontman’s imbalances may be more precarious then Jon imagines. It is no secret that white-hot British actor Michael Fassbender is the guy inside of Frank’s head. He achieves a shockingly complete performance given the obstacles with which he is (literally) faced. Battered, bruised and a little nuts? That’s what the film’s whimsical side might say but the film’s unexpected serious side refuses to take mental illness lightly. 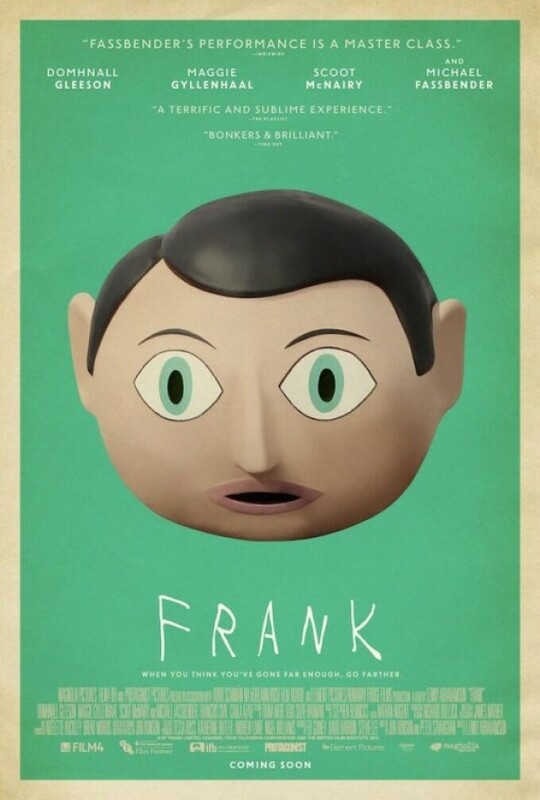 Ultimately it is unclear whether Frank the musician will make the musical masterpiece that might be inside of him but the film Frank sustains a mix of cutesy and pathos that is modestly ingenious in its own right. This entry was posted on Thursday, August 21st, 2014	at 11:50 pm	and is filed under News	. Responses are currently closed, but you can trackback from your own site.